June 1: Syd Goldsmith launches his 1967 riots memoir "Hong Kong on the Brink"
Syd Goldsmith’s first taste of China’s Cultural Revolution is blood on his tongue. It’s 1967. Hong Kong is simmering, plagued by communist-led riots and strikes, crippled transport, punishing water-rationing, takeover threats from Beijing and roadside bombs. And Syd — the only Caucasian Foreign Service Officer at the American Consulate General who speaks Cantonese — is made responsible for reporting and analysis of the Hong Kong government’s ability to survive. Come and meet Syd at 6.30pm on June 1, at Bookazine: 3/F, Prince’s Building, Central, Hong Kong. Full details in the graphic above or here. Wine will be served. All welcome! 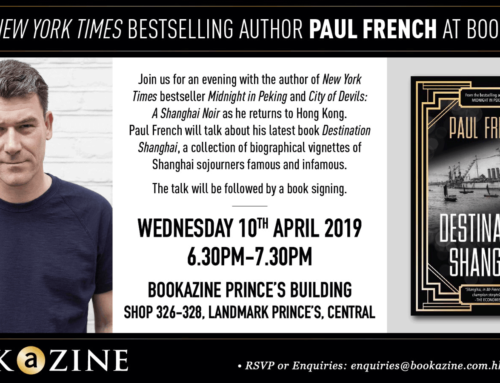 Tel: 2522 1785 or enquiries@bookazine.com.hk.